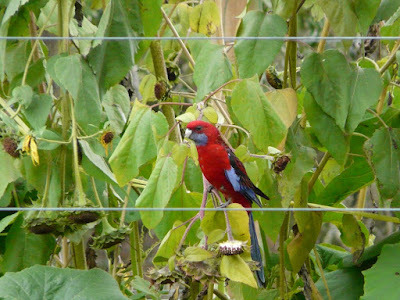 As I write this I’m looking out the window into my veggie garden where the rosellas are having a feast on the sunflowers again. There was so much activity around my sunflowers and tomatoes (probably an exquisite combination for the birds… actually sounds quite nice really, but probably nicer lightly roasted/grilled 😉 ) I decided to take a few photos. 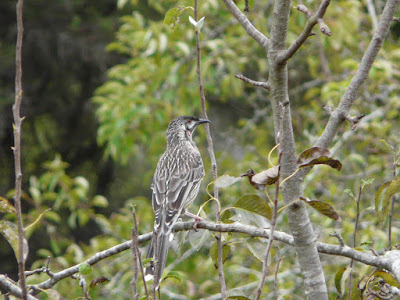 Red Wattle bird. These guys love tomatoes, apples and pears . 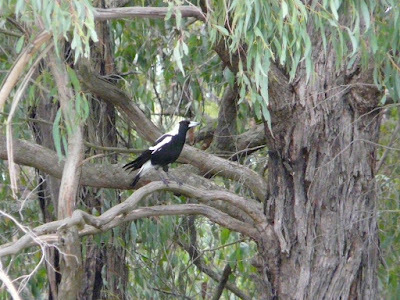 They are called “Red” because of the red things (called wattles) on their neck. Those are so exotic to this Vermont based girl. We don’t have a lot of brightly colored birds around here – cardinals, finches are common. Anything else is a little thrill for the day. 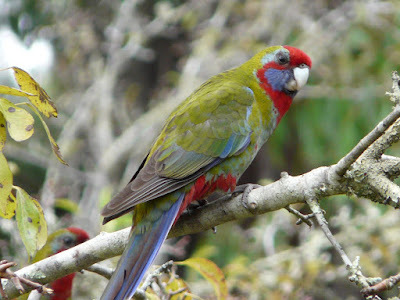 Would you beleive that the first picture of the Rosella (the greenish one in the orchard) is possibly a young scarlet rosella ! There’s a lot of them, so I’m not sure if they are a sub species or the young’ones. the young ones often have simialr colors but much more motley. One really bright one we get here is the king parrots. Similar kind of bird, but the colors are almost flurescent. Do you have wood peckers there ? I can’t think of other brightly coloured birds I’ve seen there. Wow, those cardinals (just did a wikipedia on them) are pretty bright !!! «Apple = Malus or is that "Malice"